1. L'Occitane Neroli, The original. I'm about to open one of my backup bottles, and must tell you that I'm so grateful to have those backups. I still remember that a bottle in 2004 cost around $40. This modest little thing is nothing short of gorgeous. I wish they'd bring the real thing back. 2. Guerlain- Shalimar Light. There's always some form of Shalimar. I've allowed myself to wear it a lot more often since realizing that I really do have a lifetime supply of this gorgeousness (idea for a future post: backup bottles). 3. Serge Lutens- Miel de Bois. Obviously. 4. & 5. I bought the Blond these bottles of Lavande Ombree by Au Pays de la Fleur d’Oranger and Hermes Bel Ami Vetiver a couple of months ago for our anniversary. I've been enjoying them myself quite a bit. Reviews coming soon. 6. And speaking of our anniversary gifts, Vero Profumo Rozy is heavenly on a cold day. 7. More Serge Lutens: L'Orpheline. It's a weird little thing, very un-Serge. I'm wearing it a lot trying to figure it out. eventually I will. 8. Issey Miyake- Le Feu d'Issey. Yes, another long-discontinued one (and another weird one). I have a bunch of samples, not a bottle. Trying to decide if it's worth the splurge for a bottle at some point. On some days it feels like it does. Other times I think I can just go and buy Secretion Magnifique. 9. Chanel- Cuir de Russie (extrait), both from my very vintage and semi-vintage bottles. Like slipping on a beloved old coat. 10. Parfumerie Generale- Aomassai. I don't know how I lived without a full bottle for so long. An inedible gourmand. Or maybe you can eat it, like the witch's house from Grimm's Hansel & Gretel. I am going into summer in my part of the world but ..... I would love to smell Vero's Rozy! I've not been wearing much lately because I've been having so many migraines due to the unstable weather, but my usual fall favorites are 10 Corso Como, Botrytis, and Frapin 1270 (the old bottle). Started November in Miel de Bois and Five O'Clock au Gingembre. Nothing like honey and spices on gloomy days, which means Comme des Garçons (the original EdP), Tea for Two, Chergui and the like will be on the menu soon. Can't wait to read your review of L'Orpheline! I find it very hard to describe and pin down, probably because it was love at first sniff for me and I find it very moving. It has a safety blanket vibe. Look forward to seeing your organization photos. 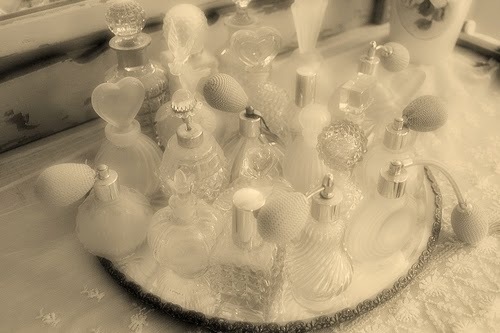 I *need* to work at mine - way, way too many gorgeous scents suffer the fate of being out of sight, out of mind. Am currently wearing a lot of Palimpsest (and multiple others of Mandy's scents), NK Incense, SL Bois et Fruits (need to spend time with L'Orpheline), Lea, MdO Musc and Vetyver, Vero's Rozy, My Sin and Scandal, Chant d'Aromes (please, spring, return!) and Vol de Nuit. I also periodically go through a phase where I really focus on wearing scents by a particular perfumer and recently I've been totally in the mood for Germaine Cellier perfumes - mostly Bandit, Vent Vert, Visa (I know Jean Carles is often given as the creator of this one, but I choose to believe at least for the moment that it was GC since I'm in the mood to wear it and I think it's in sync with her style), Balenciaga's Fleeting Moment and it's close cousin Elysees 63.84, Miss Balmain and Jolie Madame. Not sure why, but although I do love Fracas, I just haven't felt compelled to wear it during this phase (well, not yet, but this may change). Miel de Bois, Musc Ravageur, and Cuir de Russie--although at 10:30 AM it is already 78 so I think today will be a light floral kind of day. I'm wearing a lot of Shiseido Feminite du Bois Extrait, Sonoma Scent Studio's Jour Ensoleille, PG's Indochine and Fendi's Theorema. I'm going through a lilly phase: Shanghai Lily, Donna Karan Gold (both the EDP and EDT are gorgeous) and Ineke's Gilded Lily. Also enjoying Sisley's Soir de Lune at nighttime.